Plenty of speculation recently about about the future of the Eagles offense. Can LeSean McCoy, minus six pounds, take over for Brian Westbrook? Will the offensive line pull its weight? Is there a new #1 receiver? Should the Eagles switch to Kelly Green permanently? Well, maybe not that last one. The obvious change, based on our own eyes, is the difference in arm strength and accuracy. Donovan was tremendous at throwing the deep ball, but infamous for being rather streaky in the short/mid-range passes. Kolb doesn’t have that cannon arm, but he’s supposedly “more accurate.” Will that influence the play calling? And how much? Can we find a way to see what the passing offense will look like come September? First things first: Kolb’s numbers are victim to small sample size problems. Kolb threw only 20% of the balls that McNabb did, so his stats aren’t as reliable (although they do refute the stupid myth that Andy might run the ball more with Kolb). They are likely to change as he plays more. Perhaps Kolb’ll get better starting every day. Or maybe teams will get used to him and learn how to rattle him. Impossible to tell. Either way, the numbers can tell us a lot about the differences from last year (when Kolb and McNabb were playing with the same supporting casts), and what we might be able to expect in 2010. Clearly Kolb threw a lot more short passes — an over 15% bump. Also, the percentage of times he chucked it long was cut almost in half from McNabb’s numbers. The gaps may not look huge on the graph but consider them over the course of a season. If he throws at the same pace as McNabb, Kolb will get in 80 more short (0-10 yards) passes and about 36 fewer long balls (20+ yards). That’s a major difference in play-calling (or could partially be execution) and would indicate a somewhat more “typical” west-coast offense is in town. Okay, so Kolb is throwing more short passes. But is he completing more of them? However, there is an absolutely enormous gap in completion percentage on longer passes. Donovan completed a ridiculous 41% of his throws over 20 yards. Kolb, with limited action, only completed one in seven attempts (granted, that one did go for a 71-yard TD). If that trend continues, it would be a ridiculous swing what would make the Eagles much less inclined to go to the long ball. In my mind, this is the most striking graph. 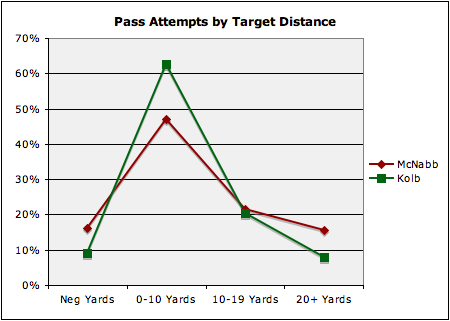 Essentially YPA measures the expected output from any given pass attempt. We can see what the “best” plays are to call because the estimated yards gained shows us the optimal point. For example, look at McNabb’s numbers — the farther he threw the ball, the better the outcome was, on average, for the offense. This is the simple reason why the Eagles threw the ball so much downfield in recent years. You can complain about boom-bust, but when McNabb was behind center, the Eagles gained maximum output when he was passing it 20 yards or more down the field. For Kolb, at least right now, that is not the case. His sweet spot is in the intermediate, 10-19 yard range. 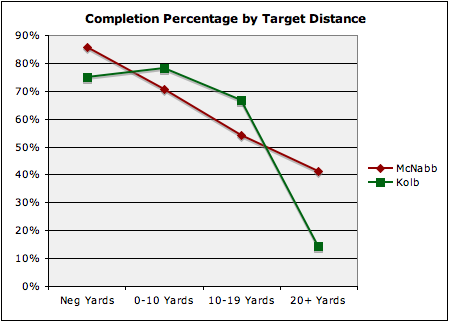 That’s where Kolb’s accuracy makes him most productive (actually just as productive as McNabb throwing long). So what does this all mean? 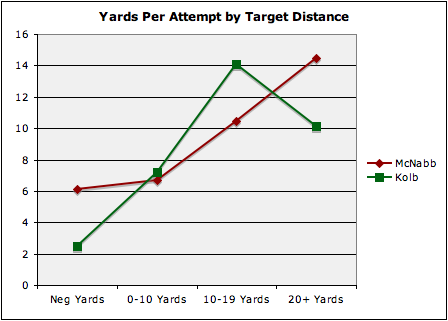 It means yes, there will be many fewer bombs launched 45 yards down the field to DeSean Jackson. But it doesn’t mean, in any way, that the Eagles will be less explosive — or that Jackson won’t be as productive (as has been the current meme, debunked by Derek at IgglesBlog). It simply means the throws that result in explosive plays will be different. Rather than launching passes to Jackson after he’s 5 yards past the centerfielder, Kolb will have to get him the ball in the short and intermediate areas. From there it will up to Jackson (and Maclin, Celek, Avant) to run past or through defenders. DeSean may not have gone out as far before he caught the ball, but he was just as — if not more — productive and explosive with Kolb behind center. DeSean got more targets, receptions, yards, and touchdowns than he had in the average game with McNabb, plus had his two longest receptions of the year — all because of Yards After the Catch. Jackson already ranked 9th in the NFL last year with 6.6 YAC per Reception (25% of snaps or more). Yet Jackson’s 15 YAC/Rec. over two games with Kolb throwing him the ball blows away the rest of the receivers. The explosion will still be in the passing game next season. Based on these numbers though, it’ll just be in a slightly different package. Tagged with Kevin Kolb, Donovan McNabb, Offense, Passing, Receptions, Philadelphia Eagles, Pro Football Focus, Statistics, Analysis, Completion, Target, DeSean Jackson. May 5, 2010 by Brian Solomon.